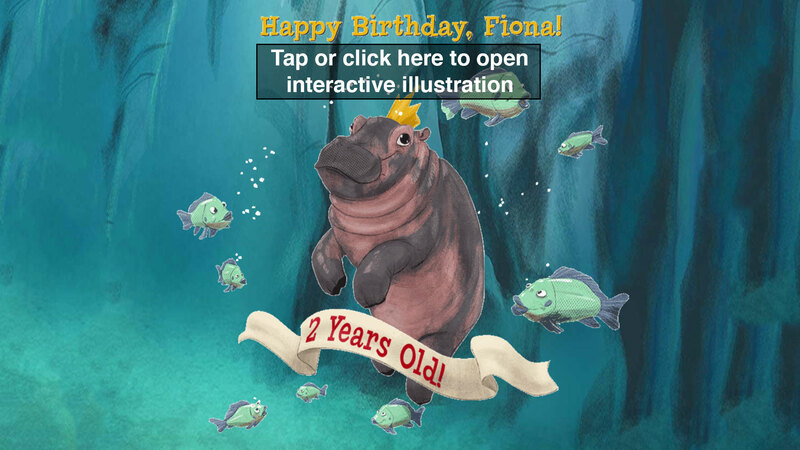 Celebrate Queen Fiona's 2nd birthday with this interactive cartoon! The queen of the Queen City is 2 years old! Fiona, the Cincinnati Zoo and Botanical Garden's hippo whose premature birth and early struggles captured hearts around the world, is celebrating her second birthday. For two years she has brought us smiles and laughs, while her and her caretakers' perseverance gave us all some much-needed hope. Happy birthday, Fiona. Here's to many more years and many more smiles. Desktop: Click on the image above and move your cursor over Fiona to make the illustration move. Mobile device or tablet: Tap the image and move your device around to make the illustration move.